Experience the legendary 1970s Planet of the Apes originally published by Marvel Comics, collected for the first time ever, and remastered in prestigious hardcover! 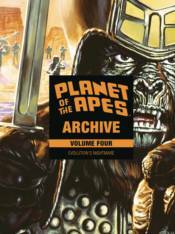 The Planet of the Apes Archive includes the screenplay adaptations from acclaimed Hollywood screenwriter for Battle for the Planet of the Apes by Paul Dehn (Murder on the Orient Express). Also collects Future History Chronicles and Evolution's Nightmare.